Center of Gravity: 2-3/4 inches back from the leading edge of the Wing. I started RC flying back in 1984 and purchased 3 of these kits to get started. You may ask why 3 kits, well that's because at the time I didn't know anything about RC or anyone that could help teach me to fly and I knew it would probably take a few crashes to get to a level that I could take off and fly on my own. Well, after crashing and totally destroying the first 2 I finally got the third one up and flying although not pretty I got it up and down in one piece. The feeling that I had afterwards was intense to say the least. Anyway, I will always be nostalgic about this plane and the ease of building and flying. (5 Stars). I learned to fly first with a 2m glider hand launched with a OS .15 Max. Then we moved up to the Stick 40. Man, what fun times back then. My best friend and I both solo'ed the ole Stick with a OS .35 Max and 3 channel taildragger. My dad and I built it in the basement, painted the fuse and tail feathers, and monocote covered the wings. I loved this plane for many years! I even towed a banner with it at one of our club fun-fly events one year. Thinking of building another just for old times sake. The stick builds easy, I remember the wing to be SUPER STRONG, with standing many cartwheels during landing and takeoff mishaps. It lands slow, and is very well behaved in the air. All in all, I'd say about the perfect trainer. 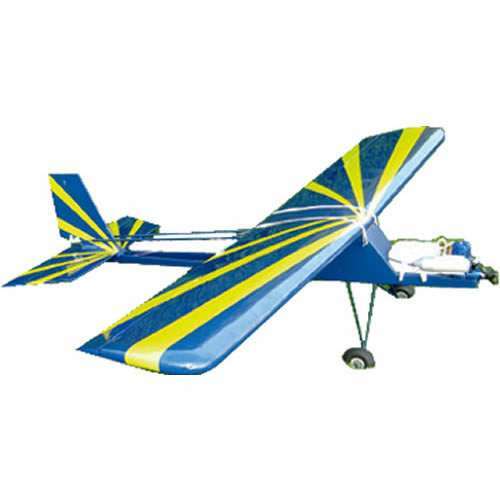 The Stick 40 was my first RC airplane. I built the 3 channel version as a freshman in high school in 1987. Back then, they included an instructional video which was a tremendous help to me as I knew nothing at the time. I've lost count of how many planes I've built since then but I can still remember the pride and satisfaction when my Stick 40 flew for the first time. My brother was sure it wasn't going to actually fly. I was able to solo it after about 10 flights. Later, I also built the aileron wing kit. The stick 40 may be ugly as sin but its a great little plane. Its easy to fly due to its low wing loading. Its a durable design. The model airplane landscape has changed quite a bit since I was a freshman in high school. We now live in an age of foam/electric ARF's. Some people frown at the idea of having to build a plane from a kit. As a young man, I know I learned more from building the Stick 40 than I ever would have with an ARF. I would STILL recommend this as a first trainer.